Excessive moisture is, perhaps, the most common reason for rust. As we all know, moisture facilitates the process of rusting. While your metal patio chairs are likely to be more resistant to the effects of water, you can never be too careful. What this means is that to prevent rust on metal patio chairs, you should keep them as dry as possible. Letting the water set in on your metal patio chairs for extended periods of time will allow the scourge of rust to settle in. This is why it’s of utmost importance for you to wipe off any water that might be present with a dry rag, as soon as you notice it. 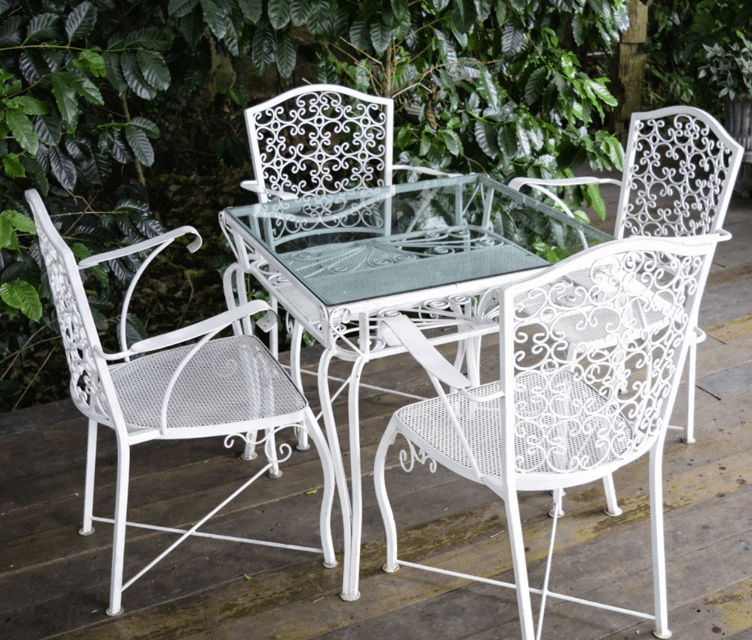 Remember: your patio chairs might be made of such a metal that are resistant to corrosion. But you’d always be better off if there isn’t a need to test the manufacturer’s claim! An easier way of keeping your metal patio chairs dry—and free from rust—is to keep them covered. Keeping your metal patio chairs covered with a sheet will do wonders for the purpose of keeping them moisture free. However, covering your metal patio chairs with “any” sheet is bound to remove the spice from their appearances, right? This is where the patio chair upholstery comes into the picture. Not only will the upholstery make your chairs look appealable but it protects them from the harmful impacts too. So, it would be a good idea to add some cushions, arm covers and chair backs to them. Doing this will not only make the metal patio chairs more comfortable and appealable but, at the same, reduce their exposure to heat and moisture. This is bound to bring those chances of corrosion down, right? It’s understandable for you to feel like your metal patio chairs are “made” for the great outdoors and that there’s no need for you to put them into storage…ever. But the fact of the matter is that there’s a need for your metal patio chairs to go into the storage every once in a while. This is because people tend to lag behind on the maintenance of their metal patio chairs when they are not in frequent usage. It’s important, therefore, for you to put them into storage when their services are not required. For example, your metal patio chairs aren’t expected to be used much during the winters, right? With that being said, won’t it be foolish to leave them out into the open, at the mercy of the elements, anyways? It’s advisable, therefore, for you to have a shed, or some other closed area, where you may be able to store them so you can prevent rust on metal patio chairs. You may even consider investing into a large outdoor furniture cover for your metal patio chairs and make use of its water resisting characteristics. You can also use a paste wax for protecting your metal patio chairs from the scourge of rust, owing to the exceptional water resisting qualities that the paste wax possesses. What you’ll need to do, first of all, is get all of the dust off of your metal patio chairs by wiping it with a dry cloth. Next, you should clean your metal patio chairs with a moist cloth and then let it be until it’s completely dried. Once the patio chairs are all dried up, use a wide paint brush for applying the paste wax all over the surface of your metal patio chairs. Remember, however, that you’ll need to exercise great care while doing that. Make sure that you apply the paste wax to every nook and corner of your metal patio chairs, including the crevices and cracks. Once you’ve applied the paste wax all over the surface of your patio chairs, set them aside to completely dry off before bringing them into usage. Regular greasing of your metal patio chairs can also do wonders for the purpose of keeping the scourge of rust away. What this means is that substances like grease and oil should be made a part of your regular maintenance kit. Protection against corrosion is only one of the countless benefits that they’ve got to offer! All of the above-mentioned tips are great, however there is another way to help prevent rust on metal patio chairs… WD-40. When it comes to protecting your metal patio chairs from the scourge of corrosion, WD40 can assist. There are a number of WD-40 products for you to benefit from. From metal patio chairs to wheelbarrow beds, you can be sure for WD-40 to have something in its repertoire to cater to your rust protection needs! All that you need to do is apply WD-40 on the surface of your metal patio chairs—or any other metal that needs protection from corrosion—and give it time to dry off. And…that’s it! With WD-40, the chore of protecting your metal patio chairs from corrosion has, truly, become a simple task!